Ecumenical services have been held at churches of the different denominations during the Week of Prayer for Christian Unity (January 18 – 25 every year). In Vence, there was a celebration at the Cathedral last Sunday, at which we were represented by Claire Ery, church warden at St Hugh’s. The largest event was held in the chapiteau at Monaco on Monday night – a church service in which clergy of all the Christian denominations participated – with circus acts included. For Father Peter, this was his fifth attendance; he wondered whether being asked to contribute (briefly) in French represented a graduation, having previously spoken in English. On Wednesday night, Holy Trinity Nice had a bilingual ecumenical Evensong. We are used to seeing people begging in the streets of Nice. Often, the sight is pitiful: a woman in an imprecatory posture with a baby or small child at her side. You find the same in any large city: on visits to Paris, you find men – rarely women – begging outside all the major churches of churches. The first time that you see this, the Christian impulse is to help, usually offering a small amount of money. But you have to be careful. I saw However, a sign outside St Eustache in Paris warning that many of the ‘beggars’ have a daily income of three hundred euros. Such exploitation of compassion can make you sceptical about giving but such scepticism shouldn’t govern all our actions. For instance, when I was a Vicar in London, a homeless man in his sixties (his name was Brian) called at our house in London on a bitterly cold Friday night in late November. He didn’t ask for money. All he wanted was to shelter in the garage of our house or even the garden for the night. He had just been discharged from hospital and he was looking for somewhere to stay until the winter shelter for the homeless opened after the weekend. After two or three hours of phoning round, we were able to find him safe shelter for that night and the three further nights before the winter shelter for the homeless opened. Brian was delighted and so were we because we felt that we had helped one of those of whom Jesus said: ‘I was hungry and you gave me food, I was thirsty and you gave me something to drink, I was a stranger and you welcomed me’ (Matthew 25.35-36). Relief of poverty and suffering is the theme of the passage from the prophet Isaiah which Jesus reads in the synagogue in Sunday’s Gospel reading. Jesus declares that he has fulfilled the prophecy that one (the Messiah, ‘the anointed one’) will come who will ‘bring good news to the poor, …proclaim release to the captives, recovery of sight to the blind, [and] let the oppressed go free.’ This passage – just like the stories of Jesus’ birth, baptism and temptation – helps us to identify Jesus as Messiah. But this empowering gift of the Holy Spirit was not given solely to Jesus. Every Christian at their baptism receives the empowering gift of the Holy Spirit. Our baptism relates us to Jesus so intimately that we share his gift of the Spirit and share his mission to bring good news to the poor, to proclaim release to the captives, to give sight to the blind and to bring freedom to the oppressed. This is the reason for the works that Christian communities are engaged in, especially the local ones that we can all be involved with: visiting those in hospital; shopping for housebound neighbours; supporting the feeding of the homeless; taking communion to the housebound; and raising money to help refugees or military veterans. However, there is always more that could be done and always the vision of involving more and more members of the community in them. They are central to the Christian life and our growth as Christians. When we do these self-sacrificial things, we experience the power of God‘s love at work in us and those for whom we care. We are not engaged in these ministries on our own: the second reading on Sunday – from Paul’s First Letter to the Corinthians – reminds us that we are all bound together in the Body of Christ, even though our ministries and gifts vary. By describing the members of the Christian community as members of Christ’s Body Paul was using a familiar image in a radical way. He could have conferred superior status on one sort of ministry by equating it with ‘the head’ of the Body. But this would have been at odds with Jesus’ message of servanthood: Jesus taught that ‘whoever wishes to become great among you must be your servant, 44and whoever wishes to be first among you must be slave of all’. So, Paul says, ‘the members of the body that seem to be weaker are indispensable.’ So, when it comes to ministry, everyone’s contribution, everyone’s ministry is valued. The Body of Christ would be incomplete, maimed, were it not for the totality of ministries. This emphasis on the value of servanthood is also the message of the Eucharist – in which we participate every Sunday. And the food of the Eucharist – Christ himself – sustains us in continuing his work. Ecumenical services have been held at churches of the different denominations during the Week of Prayer for Christian Unity (January 18 – 25 every year). In Vence, there was a celebration at the Cathedral last Sunday, at which we were represented by Claire Ery, church warden at St Hugh’s. 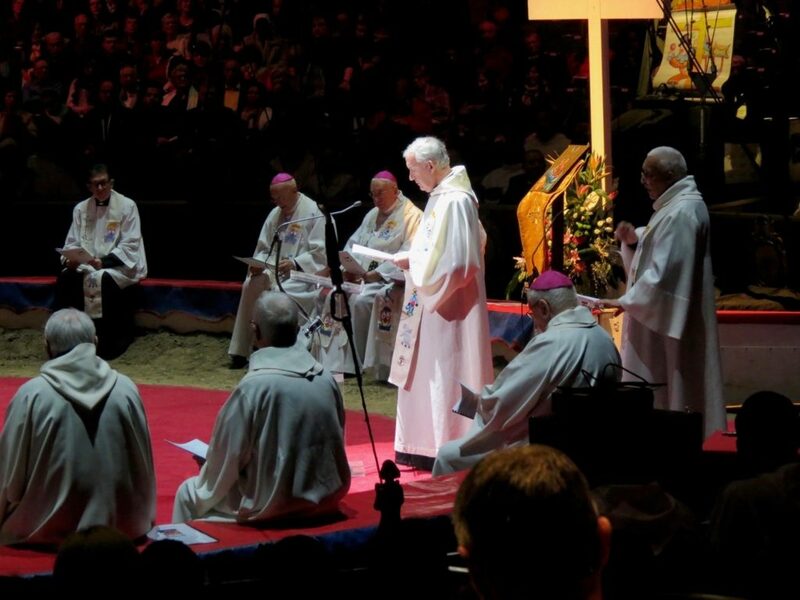 The largest event was held in the chapiteau at Monaco on Monday night – a church service in which clergy of all the Christian denominations participated – with circus acts included. 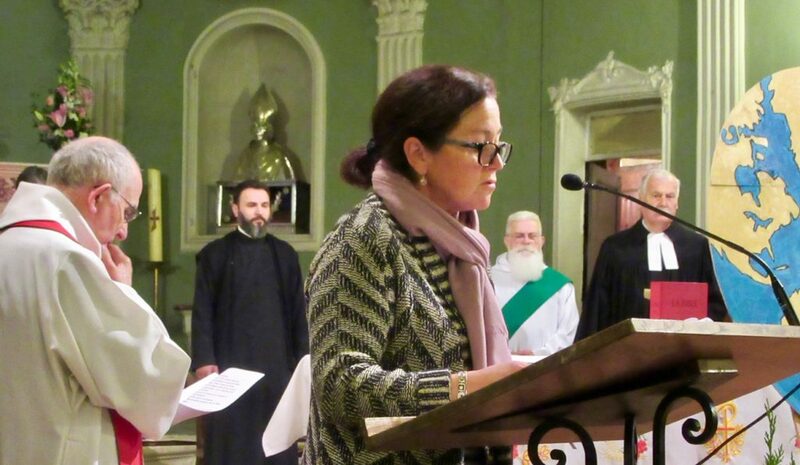 On Wednesday night, Holy Trinity Nice had a bilingual ecumenical Evensong.